Background on the game is rather light - other than a few lines posted on a forum about a corrupt Space Federation, rare star crystals being mined and the obligatory 'Resistance' (or Free People as they are referred to here), there is no real story or in-game mission brief to speak of whatsoever. 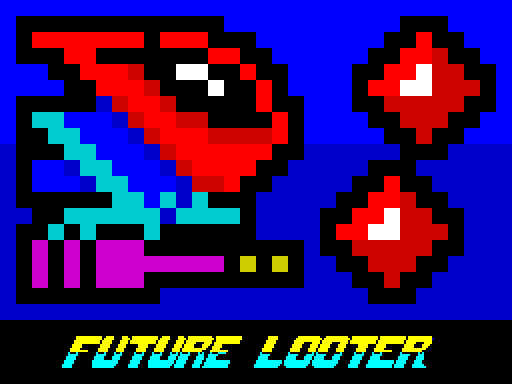 However, with a name like Future Looter it's clear what you're supposed to do - get in there, steal everything and get the hell out (preferably in one piece). From the outset you know that this is something special - the loading screen with it's super colourful blocky graphics is really stylish and the title screen music by Mister Beep sets the scene for your space raiding nicely (he seems to write music for just about every ZX game these days, doesn't he?). And then with either a tap of the spacebar or joystick fire button, your mission begins. 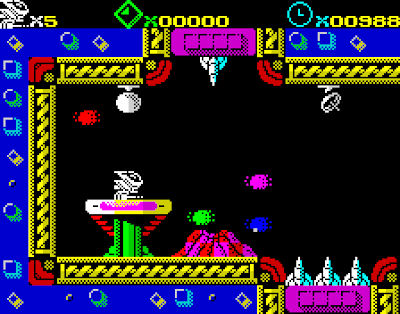 Starting in a rather Cybernoid-esque setting (complete with lava spewing volcano), you have to progress through the linear sequence of flip-screen rooms, grabbing glowey diamonds and other treasure whist blasting cute aliens and avoiding hazards. 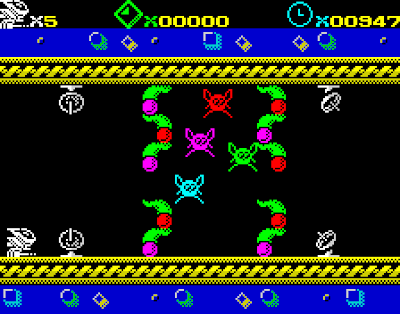 A few screens in and you'll meet the main enemies - squares with eyeballs that follow a fixed movement pattern (either turning right or left after colliding with a wall) and their diagonal flying cousins-of-Galaga - and it's these critters that you'll be using to clear some of the more puzzle orientated rooms. 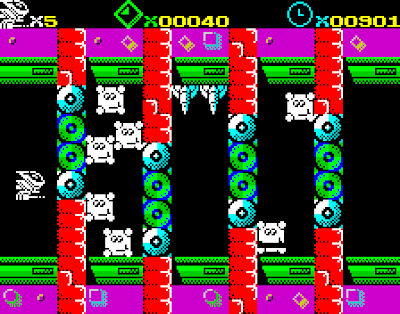 Puzzle rooms normally present the player with an impassible obstacle such as a wall of mines or a force-field. The mines are simple enough - by destroying destructible scenery you can simply guide the aliens directly into them, but the force-fields are a bit trickier as they are only removed from play when all of the mines on screen have been eliminated. Don't panic if you get stuck as there's always a reset icon available - but note that using it will cost you a life, so avoid making too many mistakes. Also, although the early puzzles are almost insultingly easy, the last few in the game really present a challenge and are some of the undisputed highlights (and life-eaters) of Future Looter. In contrast, the action-based rooms require quick reflexes and an even faster trigger finger - you'll meet indestructible bullet-firing gun turrets and missiles that launch towards you as you fly over them - some of which are near impossible to avoid. Luckily the harder screens often offer the player shield power-ups to soften the blow, and thankfully the missiles do not respawn when you die. Future Looter plays fast and features some really nice graphics, with colour clash kept to a minimum (only present when colliding with enemies). The unusually coherent map design has been well thought out (you can see the entire game map here) and as mentioned previously the action/puzzle mix and related difficulty curve is well-balanced and fair. However, with only three levels the game is a bit too short - I beat it well within an hour of loading it up for the first time. Also, and somewhat disappointingly, there is no victory screen when you complete the game - after collecting the last star crystal you are dumped back at the start of level one, and the lack of a high score table or proper game over screen means that there's little reason to continue. It's a shame really, as even the addition of a simple breakdown telling you how much loot you scored (or if the second loop of the game was actually harder with more enemies, etc.) then there would be an incentive to play again, but as it stands I can't see myself coming back to Future Looter any time soon. I would love to see a 128KB expanded version with additional levels and enemies; it seems a shame to leave such a great concept limited by 48KB of memory. As it stands, despite it's brief length Future Looter is a highly enjoyable action game and certainly one of the best ZX releases of 2011. Recommended.